It’s that time of year when leaves come gently fluttering down… along with a barrage of kamikaze acorns and other sundry tree fruits, pelting people and cars. Yes, those dry, brown acorns and assorted seedpods are fruit—structures that contain and help to spread seeds. Many people think of tree debris as a nuisance. In fact, in New York City, street trees are often selected from male or sterile cultivars to avoid the litter of fall fruits. But acorns and other fruits bring evidence of a tree’s life cycle down to our level for close inspection. Each one contains its own fascinating botanical story that kids and adults can discover this season. 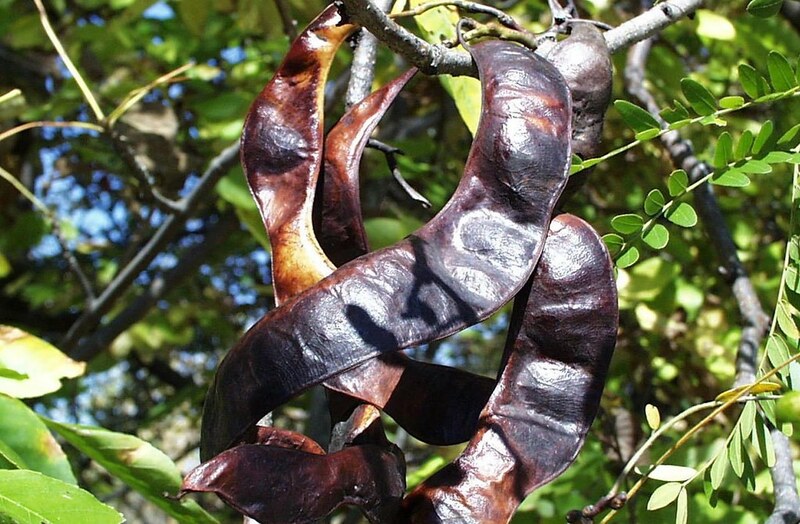 The giant, twisty pods of honey locust (Gleditzia triacanthos) look like Godzilla-sized green beans. Indeed, these pods did evolve to be consumed, and spread, by a giant. The pods contain honey-sweet pulp, believed to be a favorite food of the mastodon, a prehistoric elephant-like mammal that once lived in North America. Mastodons ate the pods, helping the tree spread its seeds. But the mastodon went extinct more than 10,000 years ago. So how did the species survive after the mastodons were gone? Recent research suggests that a few thousand years later, the shrunken population of honey locust trees found a new champion—the Cherokee people, who replanted stands across the Southeast. The Cherokee valued the tree as a source of sugar, medicine, wood for game sticks, and as a spiritual icon. Some Cherokee settlements were actually named kulsetsiyi, or “honey locust place,” after these orchards. They were called “sugar towns” by European traders. Today, this resilient tree has enjoyed another renaissance as a street tree throughout the Northeast. Treacherous underfoot, the spikey fruits of the sweet gum tree (Liquidambar styraciflua) look like plant weaponry. The fruits are green and fleshy as they develop, but by the time we find them on the ground, they are most often in their final phase—dry, brown, and pocked with diamond-shaped holes. So where are the seeds in this contraption? They used to be inside, but as the green fruit dries, the holes snap open, each one releasing an airborne seed, like an escape pod out of Star Wars. The winglike (samaroid) seeds can fly 600 feet or more. You probably know the basic story of the relationship between acorns and squirrels. The busy little mammals bury them to prepare for the long winter, and the left-behind acorns become, eventually, big oak trees that produce more acorns for later generations of squirrels. But many of the details about this relationship remain a mystery. For instance, you may have heard that oak trees drop a huge amount of acorns during certain “mast” years and much less in other years. Why? One theory is that the oak population benefits by giving squirrels and other acorn eaters more than they can possibly consume in mast years. 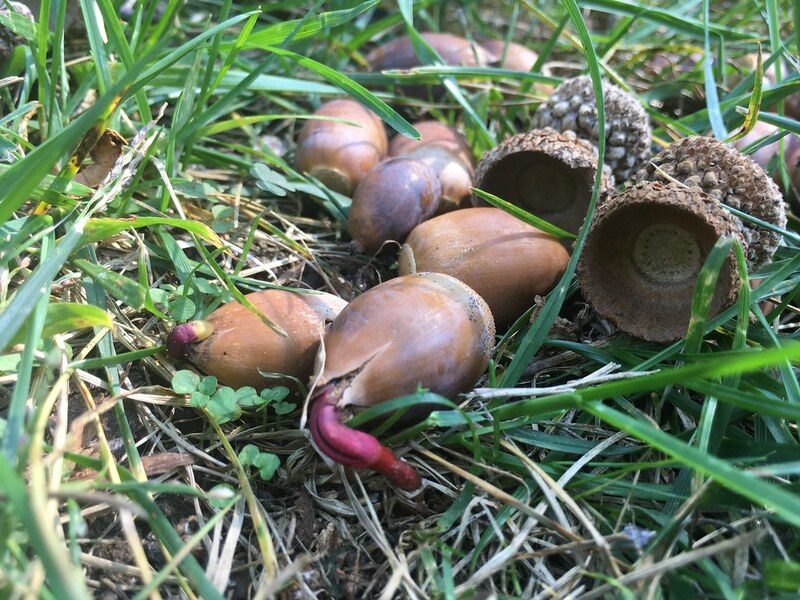 In the following years, reduced acorn supplies shrink the populations of squirrels, chipmunks, mice and other animals that eat acorns. By the next mast year, there are fewer survivors to eat the fruits. Another popular idea is that in mast years, oak trees sync up to perform a massive pollen dump that ensures good cross-pollination. More pollen, more acorns. Oak species also use unique tactics to ensure that some seeds survive the feeding frenzy. Red oaks, for instance, concentrate bitter-tasting tannins near the end of the acorn that encases the embryo. Squirrels have been observed biting off the sweeter end and leaving the embryo untouched. Amazingly, these half-eaten seeds are usually still able to germinate and grow. Learn the species of individual New York City street trees and other information with this tree map. 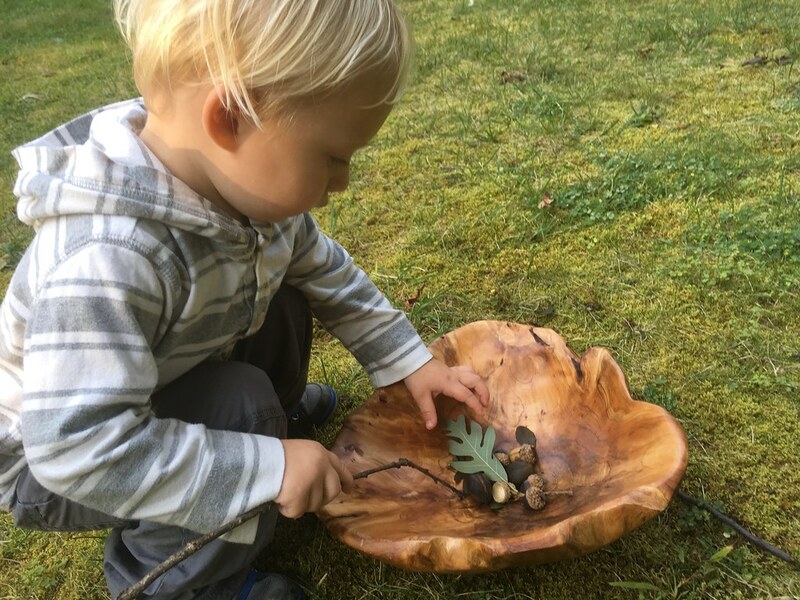 For young children, this season provides an unmatched bounty of loose parts—the term used in play research to describe objects that can be picked up and freely manipulated. Use these abundant props to inspire outdoor play before winter sets in. Make acorn "soup." You supply the pot; nature supplies the ingredients. Collect acorns and other tree fruits, stir with sticks, and sprinkle tiny bits of grass as seasoning. Host an acorn “Iron Chef”–style competition. Your imagination is the limit. Make honey locust maracas. These pods make excellent rattles. Tie some bands of colorful yarn around them to personalize them and bring them to your next jam session. Play sweet gum darts. The barbed spines of sweetgum fruit make them very good at latching onto things. Collect a bunch and chuck them at a felt-covered dartboard, or even a sweater tied to a tree. Bonus: Look for brightly colored star-shaped sweet gum leaves. Crush them to release a lovely scent somewhere between orange soda and air freshener. Start a treasure chest. The diversity on the autumn sidewalk is incredible and a great way for budding young curators to start their collections. Pin oak acorns, with tiny scarlet stripes like a millipede’s, are a favorite find. Jazz up egg cartons, candy boxes, or toy packaging with paint and hand-written labels to make neat upcycled treasure chests. A cluster of honey locust fruit. Photo by Paul Wray, Iowa State University, bugwood.org. 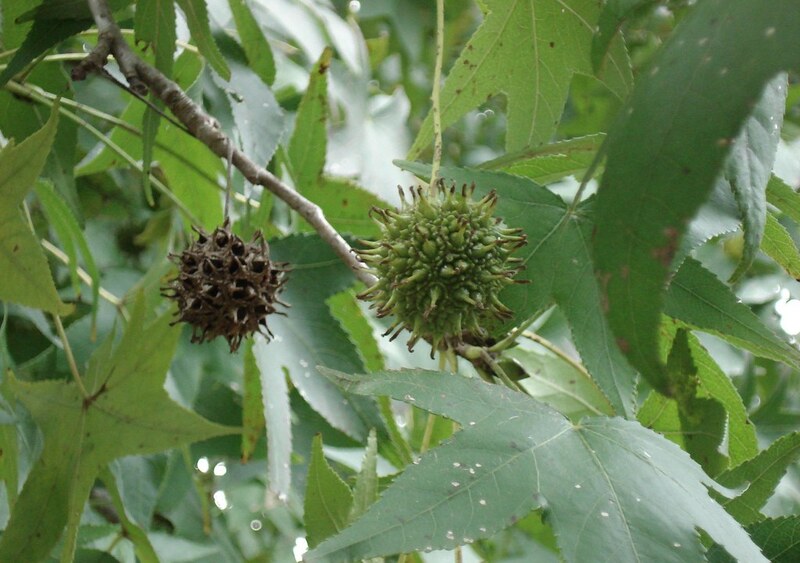 Sweet gum fruit, shown here at two different stages of development. Photo by Franklin Bonner, USFS (ret. ), Bugwood.org. 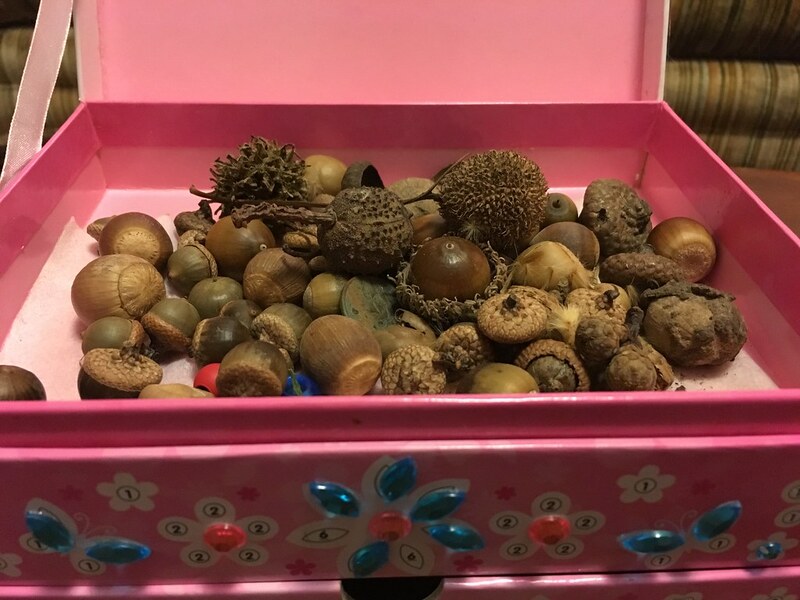 Acorns and other fruits dropped by Brooklyn street and park trees. Photo by Sarah Schmidt. Street tree acorns come in a wide variety of sizes, colors, and textures. These are possibly from a turkey oak (Quercus laevis). Photo by Sarah Schmidt.